There is no theme or story to this blog post—just what I’ve been doing this week. Earlier in the week I wove two scarves using Lunatic Fringe cotton yarns that I now have in the shop. I finished them just in time to take to The Artery for our all-member show, April Showers Bring May Flowers. Another set of scarves that I took to The Artery are called Iris Garden. 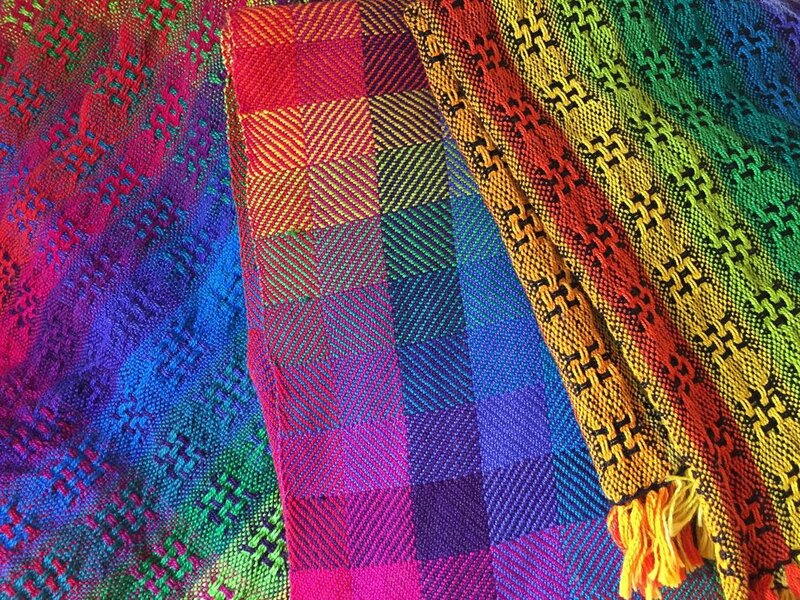 These were woven on a painted warp and I love how the pattern appears where the color is. This is the Solano County wool that I have on line. It dyes beautifully. 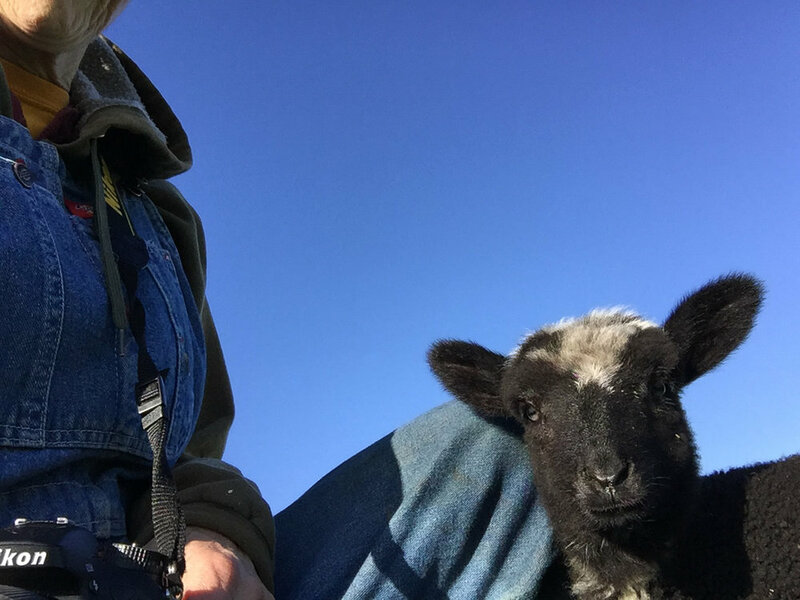 Bottle lamb selfie. I have been careful to not let her follow me to the pasture because if I go over a fence she will follow me right through it. I’d like her to forget that she can do that and learn to respect the fence so that I can keep her. I love this new feature. I requested a place to put the dog balls so we know where they are. This is mounted on the fence near the barn. 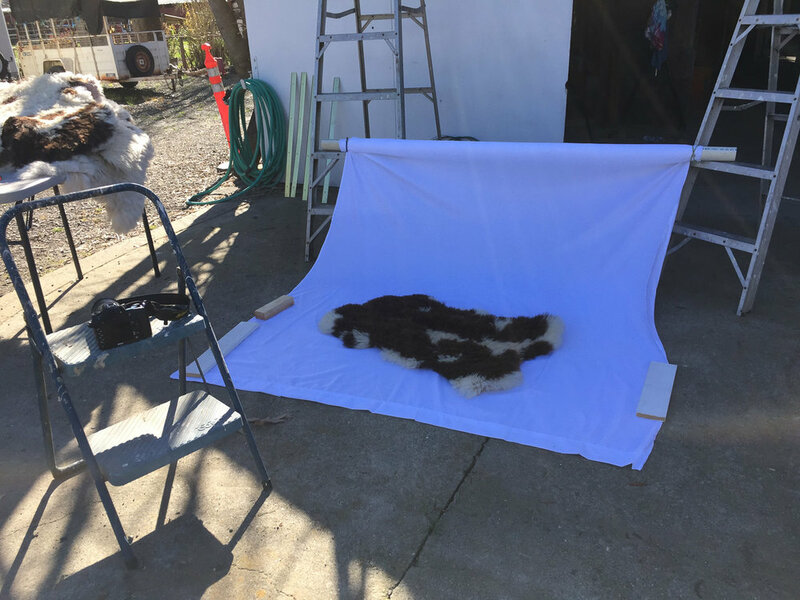 I got 36 sheepskins back from the tanner and needed to take photos of them to get on my website and the Fibershed Marketplace. I may have about half of them sold already—I’m waiting to hear from someone to whom I sent photos. As I was finishing up with sheepskins, the guys showed up. Dan and Chris had driven to Matt’s place at Pollock Pines that morning and all three rode their bikes the 104 miles back here. They had talked about doing this for a year but last year’s plans fell through due to smoky conditions and then weather. The idea was that from Pollock Pines in the foothills to Vacaville in the valley it would be all downhill, but that wasn’t quite true. Kaleena drove down to pick Matt up. We spent some time in the barn before chocolate cake and their return trip. Jade is always up for some attention. This loom has been in the barn since last fall. Someone wanted me to work on it and I just haven’t had time and kept putting it off. I needed the barn for lambs last month so we took it to the garage. I finally connected with the owner who planned to come on Saturday. That prompted me to figure out if it would work on Friday. It turned out that most of the parts were there and I put an experimental warp on it. The loom just needs a lot of TLC and maintenance. While we were working on the loom it was bottle time for the lamb so the loom owner’s daughter fed the her. Her shoes reminded me of Dorothy. Yesterday evening the lambs were in great form and I got some fun video of lamb races. I need to get time to post to YouTube and share these. I took this photo last night. The Neighbors (son and DIL) were gone and their dogs were barking, so I brought them into the house. They usually go right to the sheepskin on my side of the couch but I had decided to save the sheepskin for myself. 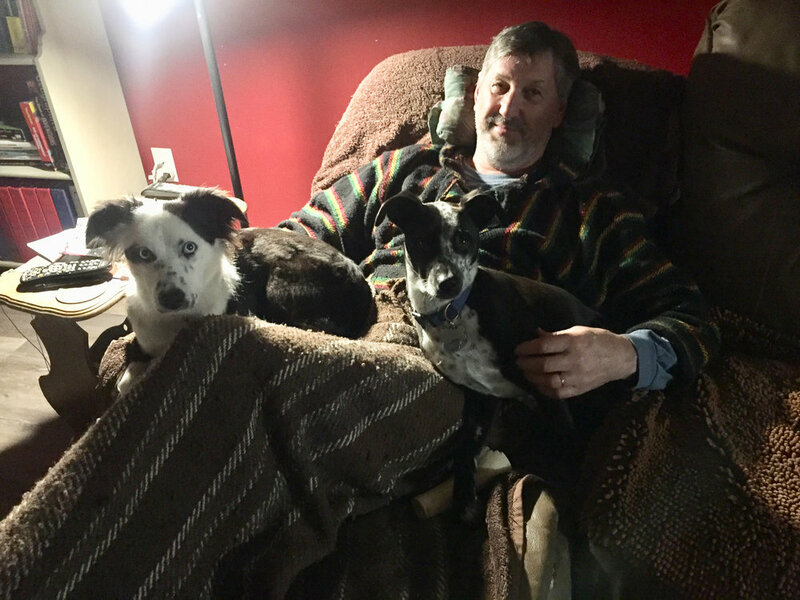 The dogs didn’t want to sit on the cold leather so they piled on Dan. That blanket, by the way, is one that I wove in about 1985 in double weave on my Baby Wolf loom. Today’s photos include a couple from the pasture. This is Vanessa with triplet lambs all trying to nurse at the same time. Tonight I thought that one looked on the thin side and I gave her a couple of ounces in a bottle when I fed the bottle lamb. She took it readily. Speaking of the bottle lamb here she is this morning. I was in the pasture clearing the electric fence line of old dallisgrass and had left my jacket on the ground after I got too hot. 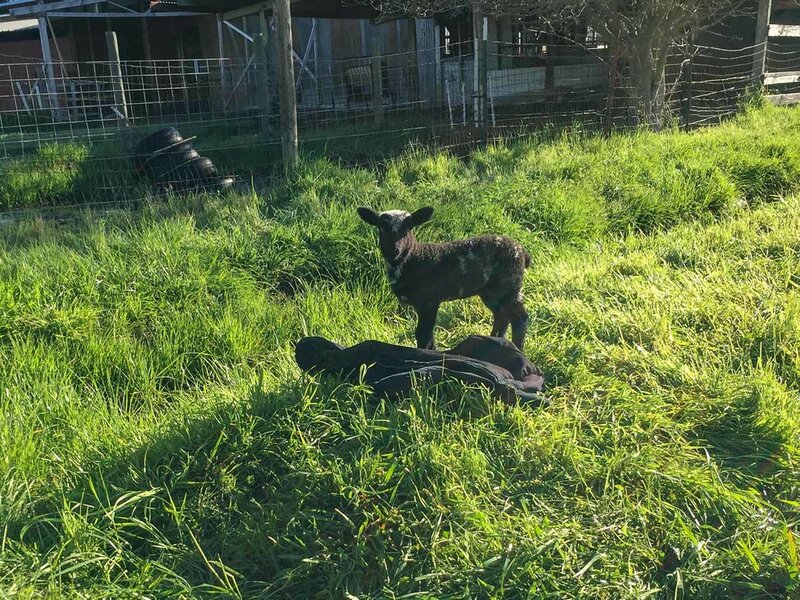 The lamb followed the other lambs and found my jacket. I think that maybe she smelled me and that’s why she stayed there. These are the new weavers from today’s class (and last week) with their finished projects.